When you can execute crafty but simple dance moves, call it exercise, and lose weight and tone up in the process... well, I am in! This is of course the premise of hugely popular worldwide sensation that is Zumba. I was given the new Zumba Fitness Core to trial on the Nintendo Wii (also available on the Kinect for Xbox 360 platform) and I was very excited! I have been taking Zumba classes and have trailed the Zumba DVDs. Plus, for this new game release I had someone alongside me give it a red hot go: my five year old daughter! With songs from Enrique Iglesias, Don Omar, Sean Paul, Kat DeLuna, Karmin, Bob Marley, and many more, it's hard not to shake your boot-ay when you slip on the disk. It's an energised dance-fitness party featuring choreography specifically designed to deliver tight and toned abs, as well as an effective total-body workout. There are 23 licensed songs of the 40 tracks featured in Zumba Fitness Core, from current chart-topping hits, era classics, exclusive re-records and genre-blending fusion tracks that together with 17 new Zumba original songs (there's something about a Zumba song... it's infectious), deliver the most diverse range of dance styles of any Zumba Fitness game to date - there are 33 in all! The newest addition to the hit Zumba Fitness video game franchise - which has sold a whopping seven million+ copies worldwide - Zumba Fitness Core features 40 new songs and routines, 33 international dance styles from around the world and hot new choreography that’s designed to produce defined abs through an exhilarating full body workout. And yes... I can feel it working! · Kat DeLuna "Drop it Low"
· Nayer featuring Pitbull "Suavemente (Kiss Me)"
· Robert Randolph and the Family Band "Ain't Nothing Wrong with That"
· Anane featuring Mr. Vegas "Shake It"
· Daler Mehndi "Ho Jayegi Balle Balle"
· Spice and Company "Lift Ya Leg Up"
· Orchestre Baka de Gbine "Gati Bongo"
· Ryan Franks "Dance of the Sugar Plum Fairies"
Choose from 45 different pre-set classes (30 in the Wii version), or customise your workout to suit your preference. Hours of fun... I have participated several times and never bored. For more, click right here. 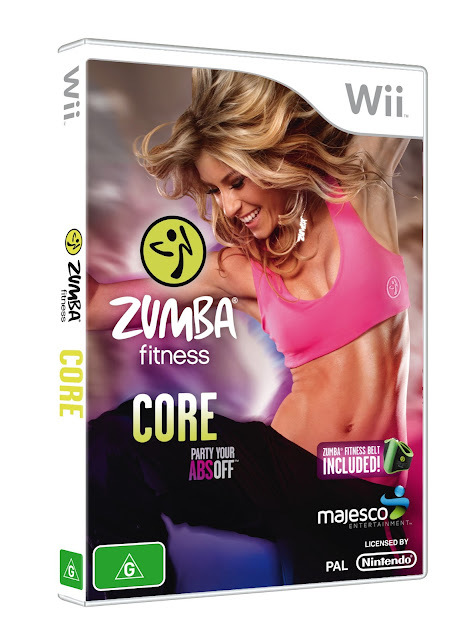 Zumba® Fitness Core is now available on Nintendo Wii and Kinect for Xbox 360 in Australia and New Zealand.